Just one metre square of a new super-sticky material inspired by gecko feet could suspend the weight of an average family car, say its inventors. The plastic, known as Synthetic Gecko, has been developed by researchers at aerospace and defence firm BAE Systems. Like the reptile's foot, the reusable polymer is covered in millions of tiny mushroom-like hairs that provide grip. Future applications could include an adhesive to repair aircraft, skin grafts or even a Spiderman-style suit. "It would mean that your local window cleaner could dispense with his ladders and climb up the side of your house," says Dr Sajad Haq, a principal research scientist at the company's Advanced Technology Centre in Filton, Bristol. "There's a whole host of applications. It's just a question of your imagination." Synthetic Gecko is not the first material to draw inspiration from the cold-blooded creatures. 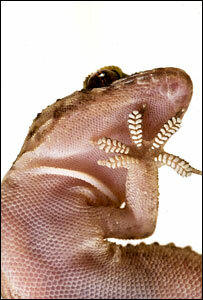 In 2003, a team from the University of Manchester created a sticky tape based on a gecko's foot. The invention followed the discovery by US scientists of how geckos perform their extraordinary climbing feats. 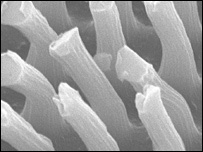 The University of California team showed that the adhesion was due to very weak intermolecular forces produced by the billions of hair-like structures, known as setae, on each gecko foot. The so called van der Waals forces arise when unbalanced electrical charges around molecules attract one another. The cumulative attractive force of billions of setae allows geckos to scurry up walls and even hang upside down on polished glass. The grip is only released when the animal peels its foot off the surface. The BAE team have created a material that mimics the gecko's setae. The adhesive is made of a polyamide, like Nylon, and is covered with millions of mushroom-shaped stalks. Stronger glues are available but unlike conventional adhesives Synthetic Gecko is reusable and does not leave any residues. The material also does not feel sticky. "It's only when you press the material to the substrate that it actually sticks," says Dr Haq. "It's the molecular interaction that causes it to stick." It is manufactured by a modified version of a technique known as photo-lithography, commonly used to make silicon chips. The technique uses light to etch three-dimensional patterns into a material. "The processes we use are modifications of standard electronic fabrication processes," says Dr Haq. "They're cheap, well known, well understood and can be scaled up to very large areas cheaply." Previous attempts at making "gecko materials" relied on more intricate techniques such as electron-beam lithography, which is expensive and difficult to scale-up to produce vast quantities of the material. So far, the team have manufactured several different materials with different sized mushrooms to try to optimise its "stickiness". They have produced several samples up to 100mm in diameter which stick to almost any surface, including those covered in dirt. However the team cannot quite match the performance of the nimble footed reptile. "The material we have made so far will hold a family car to a roof, or an elephant if you wish" says Dr Haq. 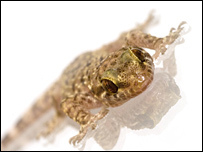 "We're not quite at the level of mimicking the sticking power of the gecko."